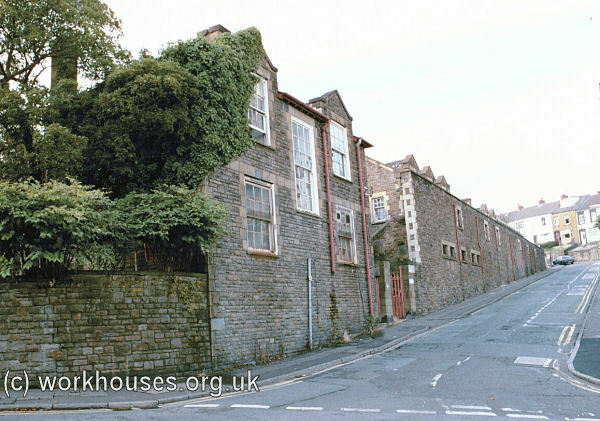 A general introduction to the history of the poor law and workhouse in Wales is provided on a separate page. A parliamentary report of 1777 recorded a local workhouse in Swansea Town to accommodate up to 100 inmates. Up until 1817, Swansea had used part of the Swansea castle as a workhouse. The Bathing House on the Swansea Burrows on the Mumbles Road was then converted for use as a House of Industry and Infirmary. We the Church wardens, overseers of the poor and several others of the Inhabitants of the said parish ... Do hereby Covenant and agree to and with David Mathew for the maintenance, washing, fireing and all other Necessaries for the paupers of the said parish that shall Come under his Care within the aforesaid House at the rate of two shillings pier week per pauper, wearing aparel and Burials Excepted ... and likewise that no relief shall be given to any person or persons that shall refuse to Come to the said House exceeding Six pence and we Do Hereby order oure overseers to provide as much bed Clothes as shall be sufficient for three bedes, and also we Do hereby likewise order our aforesaid Overseers to purchase the worth or value of one pound one shilling of bed Clothes and other Necessaries and to Deliver the same unto John Bevan pauper of our said parish. 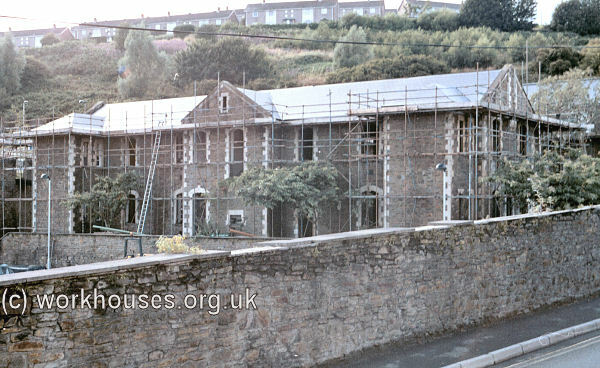 A property on School Lane at Middleton, Rhossili, now a youth hostel, is said to be built on the site on a former workhouse. County of Glamorgan: Bishopston, Cheriton, Clase (Higher and Lower) (3), Ilston, Knelston, Llandeui, Llandilo Tal y Bont (2), Llangenydd, Llanmadoec, Llanrhidian Higher (2), Llanrhidian Lower, Mawr (Higher and Lower), Nicholaston, Oxwich, Oystermouth (2), Penard [Pennard], Penderry (Higher and Lower) (2), Penmaen, Penrice, Porteynon, Reynoldstone, Rhosili [Rhossili], Rhyndroy Clydach [Rhyndwyclydach] (Higher and Lower) (2), Swansea (Higher and Lower) (2), Swansea (Town and Franchise) (6), Swansea—St John, Swansea—St Thomas. The population falling within the Union at the 1831 census had been 31,211 with parishes ranging from Nicholaston (population 92) to Swansea itself (13,256). The average annual poor-rate expenditure for the period 1834-36 had been £6,859 or 4s.5d. per head of the population. In 1857, the Swansea parishes on and around the Gower peninsula formed a new Gower Poor Law Union. Initially, Swansea continued to use existing Bathing House premises on Swansea Burrows. The building apparently had very limited facilities — inadequate dormitories, and no lying-in ward, fever ward, lunatic ward, schoolroom, or chapel. However, it continued in use until 1864. 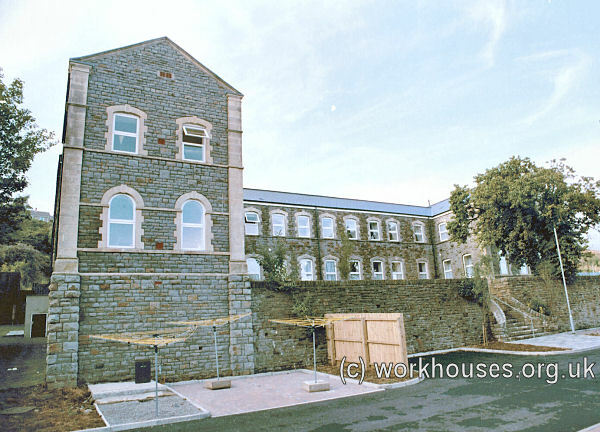 A new Swansea Union workhouse, at the top of Mount Pleasant, was erected in 1861-2 at a cost of £15,780. Its location and layout are shown on the 1879 map below. Swansea bird's eye view from the south-east, 2010. An entrance and administrative block lay to the south. To its rear, the main block was a double-couryard layout. Swansea administrative block from the south-west, 2000. Swansea main building from the south-west, 2000. The infirmary is detached from the rest of the workhouse. Itch cases and cases of scald head are now put in the married couples' wards, and the want of sufficient wards for such cases is the least satisfactory portion of the arrangements for the sick. 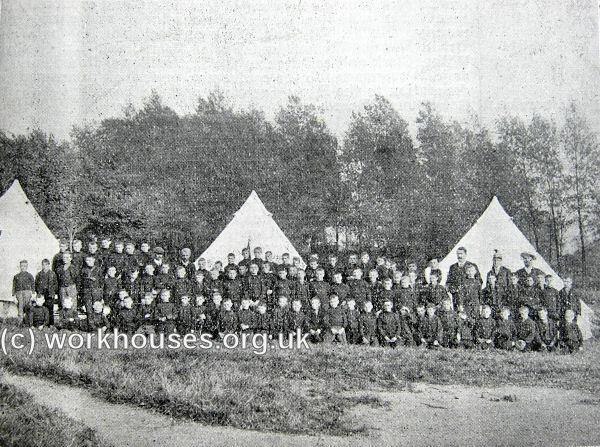 Swansea workhouse inmates, date unknown. 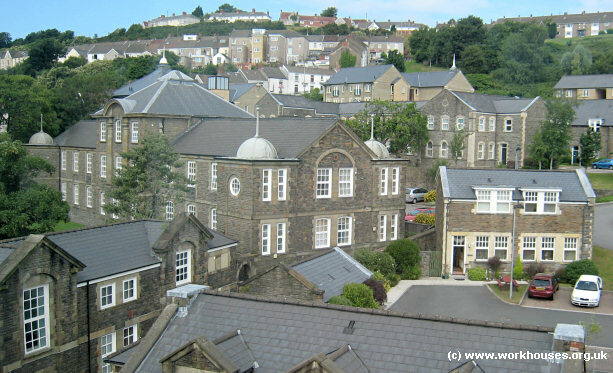 The buildings were extended to the north-east in 1884 at a cost of £30,000. By 1895, the workhouse could hold 584 inmates with 300 infirmary beds. The enlarged workhouse layout is shown on the 1919 map below. Swansea 1884 addition from the south-east, 2000. Swansea south-eastern perimeter buildings from the south, 2000. 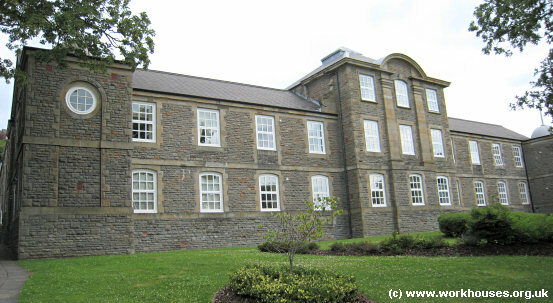 The workhouse later became known as Tawe Lodge, and then as Mount Pleasant Hospital. After its closure in 1995, the site was used a student accommodation. In 2000, the site was redeveloped with some of the old buildings being preserved and refurbished for residential use. In November 1877, the union opened a group of cottage homes at Cockett at a cost of £4,200. These were enlarged in 1879 and then comprised five plain stone buildings enclosing an area of ten acres and able to accommodate up to 120 children away from the workhouse. Although a few other unions had experimented with cottage homes schemes, Swansea's can probably claim to be the first in the poor law system that met the ideal of them being on a rural site that was completely separate from the workhouse. Swansea cottage homes site, 1921. 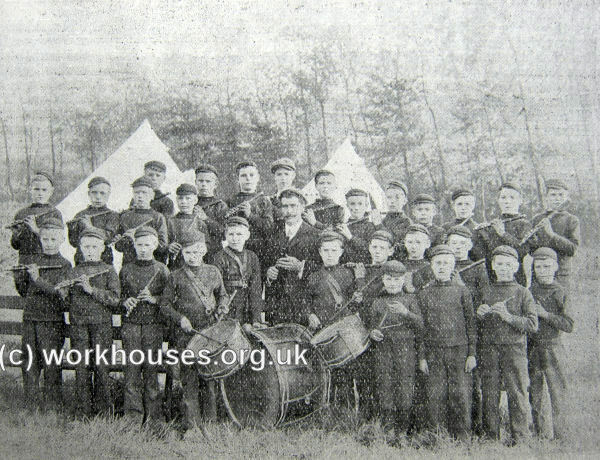 Beginning in 1900, boys from the homes spent several weeks at camp each summer alongside boys from the Swansea Boys' Industrial School. The homes have now been demolished. West Glamorgan Archive Service, County Hall, Oystermouth Road, Swansea SA1 3SN. Holdings include: Guardians' minute books (1849-51, 1860-1930, with gaps); Indoor relief book (1836-40); Deaths (1924); Creed register (1868-70, 1903-27); Punishment book (1855-80); Workhouse master's reports (1842-1914); School admissions/discharges - boys (1865-70); Cottage Homes Visiting Committee (1878-1904); Cottage Homes report books (1883-1950); etc. Ancestry UK currently has Swansea Workhouse Master's report and journal (1842-1914); Creed register (1903-14); Indoor relief book (1836-40); List of paupers (1872-95, with gaps); Births register (1866-1927); Register of deaths (1895-1920); Register of lunatics (1890-99); Punishment book (1855-80); Register of young persons (1865-70); School admissions/discharges - boys (1865-70); School attendance books (1876-7).